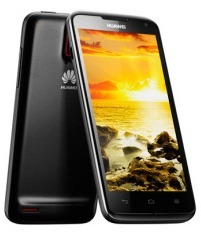 smartphoneHuawei Sunday launched its Ascend D Quad family of smartphones, which use an in-house developed quad-core processor. The Chinese network equipment companyis now trying to become a competitor in the high-end smartphone space. So far, Huawei has seen some success in the low-end smartphone sector, but at an event at Mobile World Congress in Barcelona, Spain, it was clear the company wants to move up in the world and compete with the likes of Apple, HTC and Samsung Electronics. The smartphones that will help the company do that are the Ascend D Quad and the Ascend D Quad XL, which both use Android 4.0, come with a 4.5-inch high-resolution screen and an 8-megapixel camera that can record movies at 1080p. Both phones also have 8 GB of memory. Huawei didn't announce any pricing, but Richard Yu, chairman of Huawei Device, said the phones will be 20 to 50 percent cheaper than competing products. At first, the phones will only support 3G, but during the second half of 2012 the company will ship LTE (Long Term Evolution) versions, it said. But the most important part is the processor. The K3V2 processor uses a 64-bit architecture and a clock speed running at either 1.2 or 1.5 GHz, which will help make the Ascend D Quad family the fastest phones in the world, Huawei said. Besides performance, Huawei has put a lot of effort into improving the battery life, which is a weakness in current smartphones, according to the company. For example, both versions of the K3V2 processor can switch to a low-power option when users are doing less computing intensive tasks and then speed up when they are playing games. Huawei has also added some proprietary power management technology to improve battery performance, it said. The difference between the Ascend D Quad and the Ascend D Quad XL is the size of the battery--1800 mAh versus 2500 mAh. The bigger battery makes the latter model slightly thicker--0.42 of an inch versus 0.35 of an inch. Huawei's brand isn't well known among consumers, so the company has to make up for that with better performance, according to Huawei's Yu, who also said that the company will put out a tablet, which will also have a quad-core processor. The products are impressive, and the use of Huawei's own silicon is a big step forward, according to Ben Wood, director of research at CCS Insight. Taking into account the performance combined with Huawei's aggressive pricing, the established vendors of Android-based smartphones should be worried, he said. If the lower priceing becomes a reality, vendors like HTC and Sony should be nervous, according to Francisco Jeronimo, research manager at IDC. But a good product and price isn't enough; Huawei will also have to improve its brand recognition, he said. The Ascend D Quad family will be available in China, Australia, Europe, Asia-Pacific, North and South America, and the Middle East during the second quarter of 2012.